The budget pledges over $1.4 billion in school renewal for the 2019 – 20 school year. The plan for education involves implementing recommendations based on consultations to ' modernize classrooms .' The province's website shares consultation results based on online and telephone responses, but not a comprehensive list of which employers and organizations or researchers participated, and when. The budget says consultations helped shape decisions to change the health and physical education curriculum — a second change from the government's first rollback of contemporary health and physical education curriculum soon after being elected — and improving how math is taught, among other changes. Ontarians have also heard that larger class sizes are coming for some grades , and high school students will be required to take at least four courses online to graduate. The budget also says no teacher will be fired and sidesteps anticipated teaching job losses based on plans to phase out almost 3,500 teacher jobs in the next four years . The aforementioned plans are justified under an overall goal of ' making progress and seeing results .' Like 'modernizing,' 'progress' too is a slogan, a catchy phrase. As a researcher who studies the history of educational reform in Ontario — particularly related to rhetoric about progress — I can't help but be struck by how political language masks complexity. Firstly, historically, rhetoric about progress in education concentrates on the individual student standing out from the collective. Right now, instead, the view of 'modernizing' makes the implausible claim that individuals will build resilience when educated en mass in larger classes. A mass has, indeed, emerged: students and teachers have collectively demonstrated their rejection of the province's plans . Secondly, a 'progressive' in education throughout Ontario's history has rejected the curriculum of the past. Indeed, with an emphasis on preparing students for what the budget calls 'the modern economy,' this government rejects past understandings of teaching itself as being integral to learning curriculum. Online learning will be mandatory despite expert opinions warning of potential risks . Yet in other areas — in literal curriculum reforms — this government is embracing the past and rejecting the present . Eliminating the 'new math' implies the 'old math' was better . Turning back the clock on a systematic review and rollout of health and physical education curriculum and, earlier, rejecting curriculum developments to respond to the Truth and Reconciliation Commission also denies today — and, implicitly, harkens to to an idealized version of the past . It is a curious manifestation of the same paradox that this party's name reveals: Progressive Conservative. No political party is immune to using slogans and other rallying cries. Before we were 'modernizing classrooms' in Ontario, the former Liberal government was 'enhancing public confidence .' History tells us that each government has its own brand and that its slogans override or replace those of previous governments. Brands extend beyond educational slogans to the marketing of all things within the state's influence, including, it would appear, license plates . Over the last 100 years, there have been at least three major waves of 'progressive' education in Ontario. 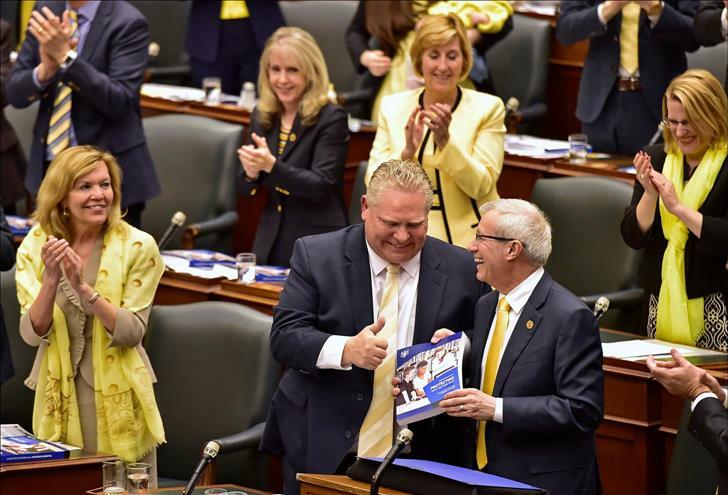 Ontario's educational reformers have always associated their ideas with what's 'progressive.' Who can be against progress? One disagrees at their peril. No one wants to be a regressive educator. The first progressivist wave flooded the province's educational landscape after the First World War , intensifying in the years following the Great Depression. Progressives demanded school life adjust to meet the needs of a modern world. This world was altered by social and technological changes, including industrialization, urbanization, cars, trains and war machines. The world had changed, but schools seemed to be stuck in the past. Reformers wrapped themselves in the cloak of progress, introducing subjects such as health and social studies, changing classroom organization, testing strategies and curriculum. In 1937, Ontario's Liberal government under Premier Mitchell Hepburn introduced social studies and health as subjects in public schools, all under a thoroughly progressivist reform platform. The second wave of 'progressive education' made huge waves in the 1960s and 1970s, characterized by what was known as the 1968 Hall-Dennis Report , Living and Learning: Report of the Provincial Committee on Aims and Objectives of Education in the Schools of Ontario. In the name of progress, Ontario's educators were challenged to focus on self-discovery and exploration, to re-vision classroom spaces and to make sense of new technologies in the classroom such as television programming. The third wave of progressivist thinking is recognizable by its use of slogans such as '21st century learning,' seen echoed in reports published under the Liberal Party , and the more recent rhetoric of modernization. Slogans surrounding 21st century learning, competencies and skills have been all the rage for years now .